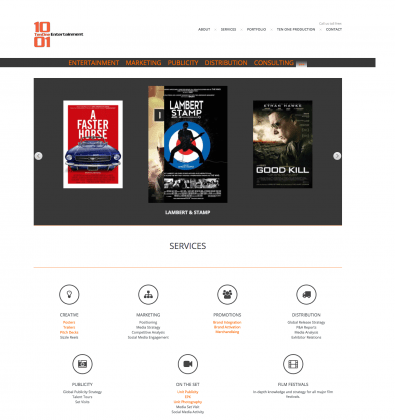 Ten One Entertainment Specialties include Theatrical film marketing and distribution strategist that includes creative advertising: trailers, posters, social media content and film positioning, global release strategy, P&A budgets, global publicity strategy, on set management of EPK, unit photographer, publicist; foreign sales markets and film festival pre sales tools, product placement and integration during production; corporate branding. In 1997 Burke helped launch the international marketing and distribution division of Lakeshore Entertainment, an Academy Award winning independent theatrical production and distribution motion picture studio. As head of worldwide marketing, Burke conceptualized innovative marketing strategies, campaigns and distributed 60+ films with an international gross exceeding $1 billion, $2 billion worldwide. Films include Academy Award winning Million Dollar Baby, The Underworld franchise, Lincoln Lawyer, The Ugly Truth, Fame, Exorcism of Emily Rose, Runaway Bride, The Gift, Arlington Road, The Mothman Prophecies and Crank 1&2.